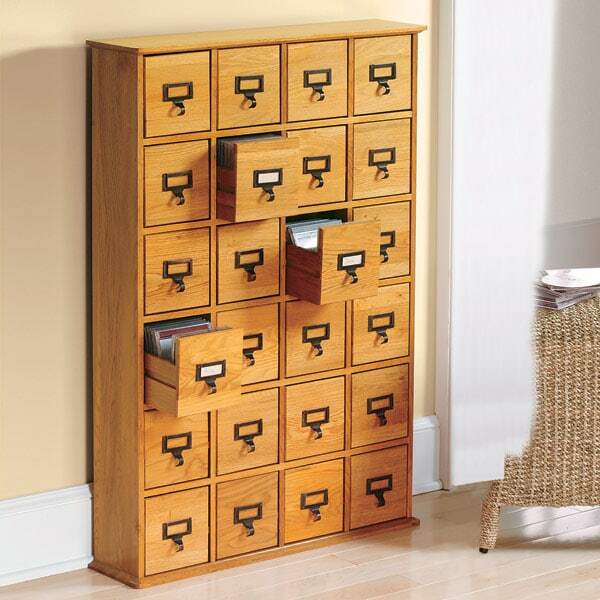 Inspired by classic library fixtures, our solidly built Birchwood storage units have vintage-style finger pull/label holders (minus the Dewey decimal numbers). Each drawer holds a dozen CDs. Paper labels included. Specify Oak or Cherry finish. Comes fully assembled. 12-drawer cabinet (HA2002) (15 1/2"W X 40"H X 8"D) holds 144 CDs; 24-drawer unit (HA2022) (32"W X 40"H X 8"D) stores 288. No rush delivery or gift wrap. Sold Separately. Item can only be shipped within the Continental US. Extra shipping charges for this item: $+6.95.